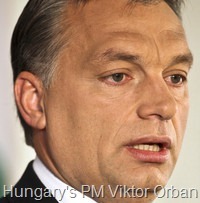 Article first published as European Debt Crisis Deepens, Spreads to More Countries on Blogcritics. Ireland bailout worth 85 billion Euros could not convince the markets that the crisis would not spread to other indebted Eurozone countries. On Tuesday, debt costs of Portugal, Spain and Belgium have touched life time high levels in euro’s 12-year history. Late on Tuesday ratings agency placed Portugal on credit watch over its huge debts, signalling the next country to ask for joint aid from the EU and IMF would be Portugal as per BBC News. Portugal’s central bank warned about the risks being faced by its banks. Failure of the Portugal government in consolidating public finances may lead to Portugal banks to face intolerable risks, the central bank warns. France already came forward saying it will support to help Portugal and Spain if such a need arises. Financial officials in France and Germany accused investors for acting irrationally on the threat of financial contagion. The yield on Spain’s 10-year bonds reached to 5.7% on Tuesday, a record difference of 3.05% compared with Germany’s 10-year bond. Bond spread for Italy’s 10-year bond was at 2.1 percent over Germany’s bonds and Irish bond yield stood at 9.53% while Portuguese bond yield stood at 7.05% for 10-year bonds. However, the yields for governments bonds of these countries are reportedly lowered on Wednesday on speculation that the European Central Bank would take extra measures to save Euro from falling, Reuters reported. 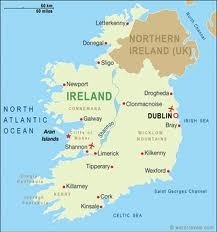 Ireland in Bailout Talks with EU? As Ireland’s borrowing costs have been pushed to record highs, it is in talks with EU officials to claim bailout from European Financial Stability Fund (EFSF). The EFSF was agreed upon by the EU and the IMF in June as a safety net to help prevent indebted Eurozone countries from slipping into debt crisis, in response to Greece crisis. Under the EFSF the 16 states of the Eurozone will provide 440 billion euros, in emergency loans to rescue crisis hit countries. The EFSF also constitutes 60 billion Euros from all 27 EU countries and 250 billion euros from the IMF, totaling to about 750 billion euros or one trillion dollars. Greece was the first country to receive emergency loan from the combined package of the EU and the IMF in June 2010. Now Ireland is on the verge of knocking EMSF’s door. Reuters quoted two unnamed official sources from EU authorities that Ireland was in talks with EU officials to discuss aid mechanism. But, the aid may be announced only in the first week of December. Ireland is said to be well funded until the first half of the next year, so the aid will not be associated with haircuts like in the case of Greece. However, Ireland denies that it is in talks with the EU, confirmed by the EU commissioner Jean Claude Trichet. The IMF managing director said he was not approached for aid to Ireland and added Ireland can manage its finances. Ireland was once the highest growth country among the Eurozone countries during first ten years since the Eurozone formation. Now it has budget deficit equal to 32% of its GDP, the highest among EU countries. It is more than ten times to the limit imposed by the Eurozone monetary system, i.e. 3 percent of GDP. Chinese Premier Wen Jiabao says his country will continue to support both the euro and European government bonds. "I have made clear that China supports a stable euro," he said. He also promised not to cut China’s investment in European bonds, despite the recent crisis, which has weakened the value of many such bonds. Mr Wen is visiting Greece, the worst hit of the 27-nation European Union. 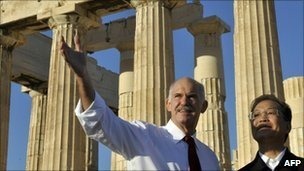 He has promised to buy Greek government bonds the next time they went on sale. China has said it needs to diversify its foreign currency holdings and has bought Spanish government bonds. Later in the week, the Chinese leader will attend an EU-China, where the subject of the yuan is almost certain to come up. China is accused of keeping its currency artificially low against other world currencies, particularly the dollar- which makes Chinese goods cheaper on world markets and non-Chinese goods more expensive within the country. That argument is hottest in the US, where the House of Representatives has backed legislation that in theory paves the way for trade sanctions on China. Prime Minister Jose Luis Rodriguez Zapatero may face a second front in his battle to contain Spain’s fiscal crisis as borrowing costs for the country’s regional governments climb. 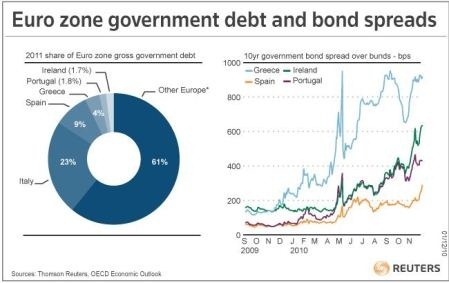 Catalonia, which accounts for a fifth of Spanish gross domestic product, has been shut out of public bond markets since March and the extra yield it pays over national government debt has almost tripled this year. Galicia, in the northwest, has asked to freeze payments of debt it owes the central government and the Madrid region postponed a bond sale last month. Spain’s regions, which borrowed at similar rates to the central government before the global credit crisis started in 2007, are key players in Zapatero’s drive to get his budget in order and push down the country’s borrowing costs. They control around twice as much spending as the state, employ more than half of all public workers and piled on debt during the recession. “If investors focused more on the problems in the regions, they would be less optimistic on Spain’s central government debt, and see that the rally in July was a bit overdone,” said Olaf Penninga, who helps manage 140 billion euros ($182 billion) at Rotterdam-based Robeco Group, and sold Spanish bonds last year. EU tests of banks’ ability to withstand financial shocks, criticised as too easy after only 7 out of 91 failed, face their own stress test in the markets on Monday with early signs pointing to a more positive response. European Union policymakers and regulators voiced relief at Friday’s results but some market analysts and many media commentators derided an exercise in which all listed banks passed as lacking in credibility. "I see nothing stressful about this test. It’s like sending the banks away for a weekend of R&R," said Stephen Pope, chief global equity strategist at brokers Cantor Fitzgerald. There was scepticism about EU regulators’ conclusion that banks need only a total of 3.5 billion euros ($4.5 billion) in extra capital. Market expectations had ranged from 30 to 100 billion euros, although many European banks have already raised capital during the financial crisis. Only five small Spanish banks, Germany’s state-rescued Hypo Real Estate and Greece’s Atebank failed outright. More than a dozen others scraped through with just over the required 6 percent of Tier 1 capital in the most stressful scenario and are likely to come under market scrutiny. However, the wealth of data disclosed by banks representing 65 percent of assets, and the commitment of banks, regulators and governments to follow-up action may well outweigh doubts about the stringency of the tests. 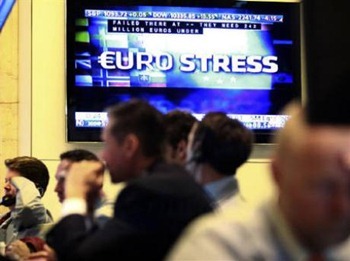 In a first market reaction in New York late on Friday, the cost of insuring the debt of large European banks fell further and the euro rose against the dollar despite worries about the tests’ credibility. Better-than-expected economic data and business confidence surveys suggesting the euro zone will avoid a double-dip recession despite fiscal austerity measures are also helping revive investor confidence in Europe. Given the haggling among EU governments and regulators about the stress tests right up to the last moment, the degree of transparency was greater than had been expected a few weeks ago. Sources familiar with the discussions said Germany fought hard behind closed doors to limit the extent of disclosure. In the end, most banks — except Deutsche — issued a detailed breakdown of their exposure to the sovereign debt of EU countries, enabling investors to run their own risk simulations to gauge counterparty’s solidity. "We have all the sovereign exposure data, and we can go ahead and do our own tests," said Nial O’Connor, a banking analyst at Credit Suisse. That should help reopen the interbank lending market, which partially froze at the height of the euro zone debt crisis in May and has remained tight due to fears that banks have been hiding big exposures. It also responds to one of the major criticisms of the exercise — that the scenario assumed a "haircut" on sovereign debt of countries such as Greece held in banks’ trading books, but not on a longer-term basis in their banking books. The EU authorities were chastised for refusing to test the impact of a default by Greece. But European Central Bank governing council member Christian Noyer said euro zone states "have put several hundreds of billions of euros on the table with the support of the IMF to make this hypothesis completely excluded". Spain, which spearheaded the drive for transparency, tested a larger part of its banking system and disclosed more data than any other country, hoping to clear away lingering market suspicion of its smaller banks’ solvency. However economist Nicolas Veron of the Bruegel think-tank said Madrid had underplayed the recapitalisation needs of the cajas, regional savings banks, although its bank resolution fund (FROBE) is well on the way to meeting those needs. "The Spanish wanted to be seen as the most transparent and deserve praise for the catalyst role they played, but in the end they clearly understated what the cajas need," he said in a telephone interview. Veron said follow-up actions by governments and regulators should include pressing weaker banks to recapitalise, if necessary with state help and facilitating cross-border takeovers of weaker banks. Even before the results were published, National Bank of Greece, Slovenia’s NLB and Civica in Spain announced plans to raise capital. Italy said it would reopen an offer of government-backed bonds to support its banks, although none failed. Monte dei Paschi di Siena squeaked through with 6.2 percent of Tier 1 capital under the most stressful scenario, and UBI Banca with 6.8 percent. Veron said the success of the exercise would depend partly on whether European regulators adopt a more cooperative approach after the stress tests than they did before them. "If this is the start of a beautiful friendship among EU supervisors, then that’s not the same as if the united front crumbles next week and they start criticising each other again," he said. Valuations on Europe’s banking sector may look cheap on paper but don’t expect U.S.-based portfolio managers to scoop them up even after stress tests showed a vast majority have sufficient capital. The results of Friday’s assessment, criticized for not being tough enough, found that just seven out of 91 European banks would need to bolster their balance sheets by a total of 3.5 billion euros ($4.5 billion) to withstand another recession. "To us the bank stress test results came out as a non-event. When you look at the results they didn’t look very stressful," said Scott Snyder, portfolio manager of the ICON Advisers Europe fund. The method of the stress test has drawn scrutiny particularly because of the way the tests treated European government debt. Even so, U.S. investors had already shown distaste for the European banking sector as data reveal the massive net selling that has occurred over the last two years. U.S. mutual funds cut their holdings of publicly traded European banks identified in the tests to just $12.1 billion from $29.8 billion, a whopping 59.2 percent decline in the last two years through May, according to Lipper, a Thomson Reuters company. The bulk of the sell-off was between 2008 and 2009. However even after the U.S. government conducted its own stress tests in May of last year — widely believed to have put a floor underneath U.S. financial shares — holdings in Europe’s banks continued to decline. "It stands to reason the most visible banks in Europe are the most scorned, perhaps because we know more about them. The holdings of ING, Bank of Ireland, Commerzbank, and Royal Bank of Scotland used to account for $4.4 billion in account assets. Now they are less than $800 million," said Jeff Tjornehoj, U.S. and Canada research manager at Lipper. By comparison, U.S. bank shares, as measured by Standard & Poor’s financial index, have risen 13.57 percent since the U.S. government announced its stress test results on May 7, 2009, through Thursday. Standard & Poor’s said it may cut Hungary’s credit rating to junk after the collapse of talks with the International Monetary Fund and European Union. Moody’s Investors Service said it may also lower the country’s grade. The IMF and EU on July 17 suspended talks with the government without endorsing Prime Minister Viktor Orban’s plans to control the budget deficit. The creditors provided Hungary with a 20 billion-euro ($25.9 billion) rescue package in 2008, which had served to reassure investors. “We believe that without an EU/IMF program to anchor policy, Hungary is likely to face higher and more volatile funding costs, which in our view could weigh on financial sector balance sheets, the public finances, and economic growth,” S&P said today in a statement. A rating downgrade would raise the cost of borrowing for Hungary at a time when the country is struggling to repair investor confidence after ruling party officials in June compared the country’s economy with Greece. S&P rates Hungary BBB-, its lowest investment grade. The Moody’s rating is two steps higher at Baa1. S&P will lower Hungary’s rating if in the coming year it concludes “government policies are unlikely to result in a meaningful decline in public debt,” it said in the statement. Hungary’s currency fell 1.1 percent to 286.83 per euro as of 3:15 p.m. in Budapest. The forint has dropped 8.1 percent in the past three months, making it the worst performer among more than 170 currencies tracked by Bloomberg. The cost of insuring Hungary’s government debt against default rose 14.5 basis points to 343, according to data provider CMA. “Running a higher budget deficit while losing your biggest potential supplier of capital isn’t a good mix,” said Kieran Curtis, who manages $2 billion in emerging market debt at Aviva Investors in London. “The market isn’t going to finance a higher budget deficit without an IMF agreement.” Hungary’s government said credit rating companies “don’t understand” that fiscal responsibility needn’t come at the expense of independent economic policy. “We’re going to continue a disciplined fiscal policy, which doesn’t equal the usual austerity policy that affects families and businesses,” the Economy Ministry said in an e- mailed response to questions from Bloomberg News.